Adelia Hernandez is recently divorced from her faithless husband and is beginning to make a new life for herself and her four children, ages eight to thirteen. Some members of her traditional Catholic family may still be unhappy with her decision to end her marriage, but Adelia knows she made the right choice. She has moved into a new home in Swan Point, an older area of her hometown, and her boss, Raylene Rollins, is so pleased with Adelia’s contributions at Chic, a clothing boutique, that she promotes her to manager. Raylene even talks to Adelia about a partnership. After years with a husband who did nothing but find fault with her, Adelia basks in praise for a job well done and her belief in her ability to insure that her children are healthy and happy grows stronger. She’s not even thinking about a romantic relationship, at least not until she meets Gabe Franklin. Gabe Franklin grew up in Serenity, a rebel with a chip on his shoulder, ashamed and defensive about his mother whose drinking and promiscuity made her a ready target for town gossip. He left town soon after his mother’s death, but he has returned determined to show the town that he is no longer the angry troublemaker he was. He’s grateful to have a job as second in command in the construction company belonging to his cousin but he’s not certain he’s in Serenity for the long term. He is certain, however, that he is not the man for permanent relationships. His attraction to Adelia Hernandez may be strong, but he respects her concern about her children. They all deserve better than another man who will move in and out of their lives. Adelia and Gabe have to fight not only their own attraction to one another, but also all the well-intentioned friends who encourage the match. Even Adelia’s kids are soon won over by Gabe. On the other side are some members of Adelia’s family and her slimeball ex-husband. But the greatest obstacle the two have to overcome on their way to an HEA is Gabe’s own uncertainty that he can ever be husband and father material. 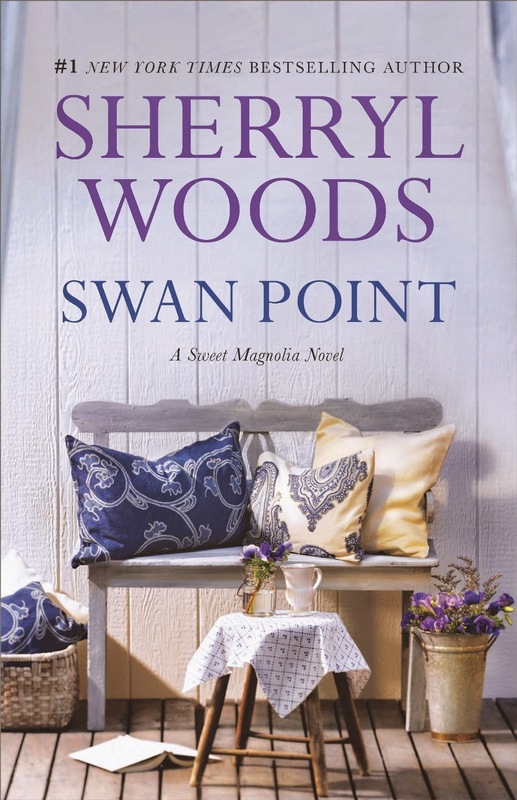 The eleventh book in Woods’s popular Sweet Magnolias series, Swan Point is a sweet romance heavy on small-town interactions and very light on sensuality. Although this book is not an inspirational, it is essentially a kisses-only romance. Readers of the series will be familiar with Adelia’s backstory and will be pleased to see her gaining self-esteem and taking definite steps toward creating a new life after her divorce. Gabe is appealing as a man who wants to change the reputation he acquired in his misspent youth and as one who still bears scars from his past. Some readers will find that his interactions with Adelia’s children add to his appeal. When Adelia’s teenage daughter circulates a photo of Gabe in tiara and boa at a tea party with her younger sisters, his reputation as a good guy is pretty much sealed. Doubtless Sweet Magnolia fans will be delighted to see many characters from earlier novels in the series playing minor roles in this one. I think that reactions to this latest in the long-running series will be determined by the level of devotion to this author generally and to other books she has set in Serenity, South Carolina. While I have enjoyed some books in the series, I found this one a too-predictable read, and for me the moments of genuine sweetness were not enough to overcome a setting that is weak in Southern flavor and a real sense of Adelia’s culture. If you like sweet small-town romances and have never read Woods, I recommend you start with the early books in this series or in her Chesapeake Shores series to see her at her best. I loved the book. Loved how sweet the h/h were with each other and the kids. Like sweet reads in between the regular romance books. Really enjoyed this series - hadn't realized there is the next book! There are just so manes tory lines out there, and we see authors using them over and over. Some do an excellent job of adding life and difference to the tale and some just tell the story which we follow along a predictable path to the expected HEA. It sounds like she didn't quite hit the mark this time, but it will still be an enjoyable, if predictable, read. She usually has lovely covers and this one is one of the nicer ones.